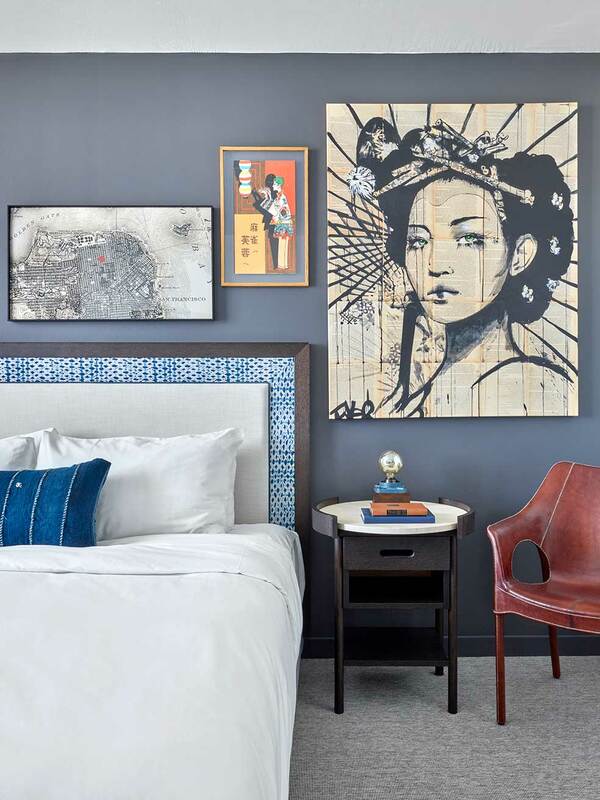 | NEW YORK, NY - August 2, 2018 | Interior design and branding firm, MARKZEFF, has completed a $28 million revitalization for Joie de Vivre of their iconic Hotel Kabuki in San Francisco’s lively Japantown district. The 1960’s pagoda-style building has a spectacular view of the city, with charming juliet balconies in each room overlooking San Francisco’s finest cultural offerings. 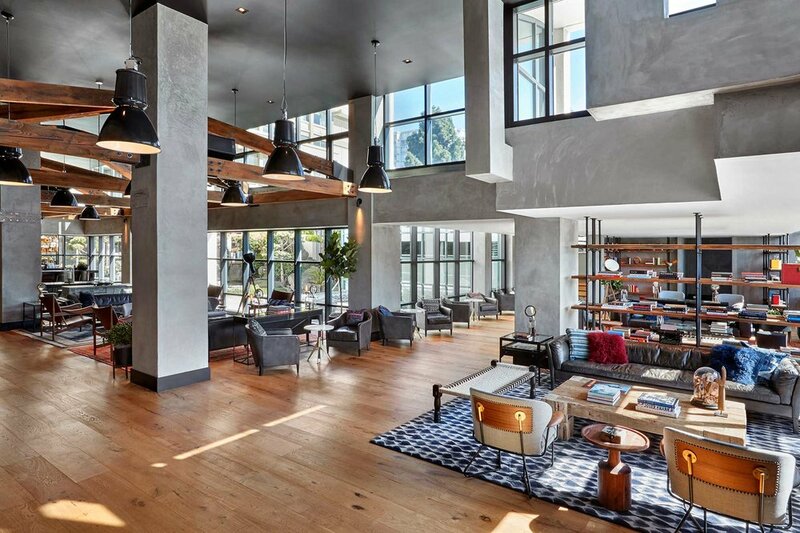 Taking influence from the counterculture movement of the 60’s and 70’s in the region as well as the hotel’s location, Zeff fused the bohemian with the Japanese to update the interiors of the historic property with a modern edge. The lobby demonstrates Eastern influence in subtle details like a Japanese calligraphy-inspired carpet, a clean-lined and Japanese-style reception desk detailed with contrasting butterfly-key inlays. Behind this desk, a backlit vintage factory window wall serves as a historic backdrop. The public space utilizes a black and blonde color palette inspired by Shou Sugi Ban, an ancient Japanese exterior siding technique that preserves wood by charring it with fire. The technique materializes in carbonized black, alligator skin-textured columns that are juxtaposed with a beautiful inverted X-beam structure made of reclaimed douglas fir. The blonde wood floors are covered with custom, hand-tufted wool carpets from the reception area to the elevator lobby. Reflecting the importance of shade and light in Japanese architecture, this blonde and black theme carries over into the exposed garden that brings natural light into the interior space. MARKZEFF reinvented the area by bringing the bar, a communal table, and a lounge together for an energized main floor. Popular records from a local record store are displayed on a console by the communal table where a DJ will curate music for different events that take place at the hotel. A nod to the major music scene happening in San Francisco in the 60’s, the display melds seamlessly with the Japanese influenced design and completes the minimalist space. “After learning about the culture of the area, and drawing on knowledge of Japanese architecture as well as my own affinity for the beat generation, we were able to reinvent and modernize the interiors of the hotel in a sophisticated way,” says Mark Zeff, Principal of his eponymous firm. Zeff developed two different room styles, each featuring custom furniture, carpets and fabric to reflect a cohesive aesthetic; the first has wallcoverings featuring vintage Japanese newspaper print, while the second references retro sumo wrestling cards in a wallcovering that lines the closet. The use of sisal carpeting throughout each type results in a relaxed and comfortable atmosphere, with subtle hints of Japanese influence found in many facets; headboards and drapery were dyed with a traditional shibori method, the patchwork style of boro stitching is used in the upholstery, and the clean lines of Japanese woodworking in casegoods. Some rooms feature bold painted doors, and others unique wall murals, replicating the experience of relaxing in a downtown artist’s loft. Furniture, carpets, and fabrics used in the interiors that were not custom made were bought from local designers and artisans, displaying an eclectic mix of California culture in the vintage and new, simple and complex. A true stand out throughout the public spaces and guest rooms alike was the art; MARKZEFF worked with a local consultant to source unique pieces like graphic Japanese matchbook covers from the 1920’s and 1930’s and historic images of San Francisco’s hippie culture, each framed with a different style to make every environment feel personally curated. While the rooms each had carefully compiled art walls that feature traditional and modern art along with Buddhist proverbs in Japanese calligraphy, the lobby has an elegant historic black and white map of Japantown used as a large scale mural on the ceiling above the reception area. Since the opening of the iconic Phoenix Hotel in 1987, JDV hotels have been emblems of authenticity and imagination. Today, our boutique hotels comprise the largest collection of luxury properties in California with locations in Chicago, New Orleans, Baltimore, Washington, D.C., and New York City. JDV is a Two Roads Hospitality boutique hotel brand.